Photo: Mai Cao, Beijing, 2010. I have been writing for three decades and been an activist even longer. The two are very connected. My day jobs have included current affairs television production, teaching (creative writing at UBC, journalism at Ryerson, any number of workshops), and for a time I wrote policy papers for arts councils, arts groups and governments. One early assignment turned into my first book, Who’s Afraid of Canadian Culture? published in 1976. Born and raised in Toronto, I studied art history at university and spent several years in France and Italy before returning to Canada in 1970 in the middle of the October Crisis. I’d been living in the 16th century, and awoke to student demonstrations on the York University campus in favour of Trudeau’s invocation of the War Measures Act. Instead of returning to the art world, I started freelancing to indie magazines (Broadside, This Magazine, Canadian Forum) and the CBC, and ended up working with a bunch of artists organizing a union for visual artists called Canadian Artists’ Representation (CAR/FAC). Most particularly, I spent time with London area artists Jack Chambers, Greg Curnoe and John Boyle. It was Jack who sent me to my first meeting on copyright reform. 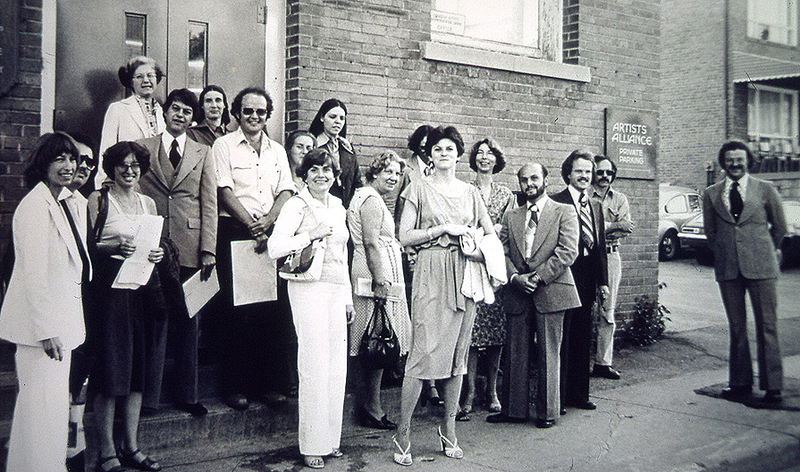 Gathering of CAR/FAC artists and supporters prior to attending the Annual Meeting of the Art Gallery of Ontario, 1974. 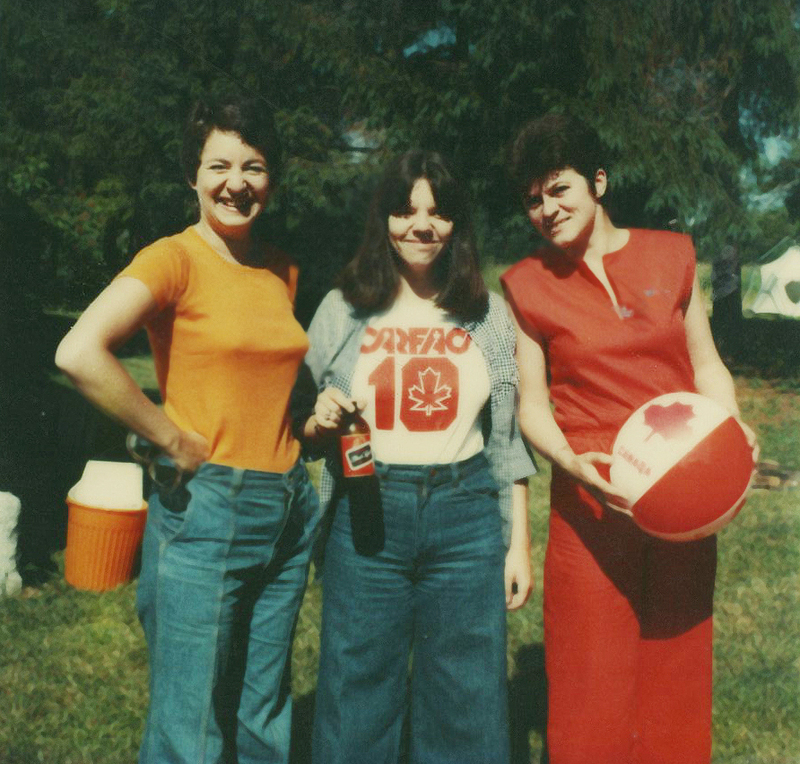 From left: Barb Hall, Larry Haiven, Judy Haiven, (? ), Tom Hendry, Jay Macpherson, Allan Sparrow, Jane Condon, Susan Crean, (?) Madeleine McDowell. Front row: (? ), (? ), Judy Gouin, Charlie Pachter, Bill Boyle, (? ), John Boyle. Photo by Marion Lewis. The seventies were a heady time; a lot of theatre companies, art galleries and publishing houses were set up then, many of them collectives. These were also the years when the Canadian film and recording industries were kick-started. Who’s Afraid of Canadian Culture documented much of this activity and argued for cultural funding that would favour Canada work to counterbalance the overwheming flood of imported American films, TV and books. Our generation of Canadian artists refused to leave Canada to work, but staying home implied the necessity of setting up infrastructure and policies to produce and distribute Canadian work. None of it existed at the time, and the arts organizations that did exists (the opera, ballet, regional theatre, symphony orchestras) made of feature of ignoring Canadian art. At the time, excellence and Canadian were rarely used in the same sentence which prompted me to remark that excellence was something best enjoyed in the privacy of one’s own home as it is, after all, a subjective opinion. The book was trashed from coast to coast, even in the financial pages of newspapers. I was accused of hating Mozart and was censored on As It Happens for using the phrase “American cultural imperialism”. It was a great way to begin. Oro-Medonte, July 1, 1978. Polaroid by C. Pachter. Through the women’s movement I encountered the labour movement. I joined the editorial collective of This Magazine when Madeleine Parent and her husband Kent Rowley were still active (co-founders of the radical Confederation of Canadian Unions). I wrote about cultural politics and feminism and edited the Female Complaints column which featured a different writer each issue. The list included novelist Timothy Findley (who offered) and the columns were eventually collected in Twist & Shout – a Decade of Feminist Writing in This Magazine, published in 1992. I got to know CUPE president Grace Hartman after she retired and became involved with the SCM Bookroom. It was Grace who hosted the launch of In the Name of the Fathers, my book on the child custody wars. What had begun as a feature for Toronto Life on the changes to the Ontario Family Law Reform Act had quickly became something larger — a story about the shift of attention away from the cause of divorce to the custody of children afterwards. And with that came the emergence of militant fathers’ rights groups who seemed convinced the courts favoured women. I was very wary of the reaction to the book, having been warned to de-list my phone number and put bars on my windows, and so extremely happy Grace was in charge of the mike at that evening. Books sometimes happen to you. The Grace Hartman biography was also unplanned. I’d always wanted to write about workers and unions, so welcomed the chance. A Woman for her Time came out at CUPE’s biennial convention in Montreal in 1995 — smack in the middle of the second referendum on Quebec independence when the streets were full of people and politics. At the time of the first referendum in 1980 I was writing a book with Marcel Rioux, the noted Quebec sociologist and indépendentiste. This project evolved from a sustained conversation between the two of us over several months, and was really two books. Deux Pays pour Vivre — un Plaidoyer and Two Nations, an essay on culture and politics in a world of American pre-eminence were written simultaneously in both official languages. Neither was a translation of the other, and the texts were slightly different. The English version is longer. Once I began publishing books I joined The Writers’ Union where I continued working on copyright as chair of the electronic rights/copyright committee. I helped set up the Creators’ Copyright Coalition in the early 2000s, and was a founding co-chair (Canada) of a national coalition of artists’ unions and collectives called the Creators’ Rights Alliance/Alliance pour les droits créateurs. The other co-chairs were Michel Beauchemin (Quebec) and Greg Young-Ing (Indigenous Peoples). For some years The CRA/ADC represented Canadian creators at international fora such as WIPO, the WTO and the UN where treaties and conventions affecting artists’ rights via intellectual property laws (such as copyright) are decided. Writing and social justice naturally led to PEN, the organization that works for the release of imprisoned writers. When PEN Canada reorganized in the 80s, I took on chairing the Writers in Prison Committee and arranged for an exhibition of Native women’s art at the Harbourfront Gallery during the International PEN Congress held here and Montreal in 1989. The show Changers: A Spiritual renaissance was curated by Maliseet artist Shirley Bear; over six hundred people attended the opening, and the show toured nationally. Shirley and I have collaborated on several projects since. Most significantly, a performance piece called Dear Sophie / Dear Emily based on letters and journals written by Emily Carr and Sophie Frank, a Salish basket maker who knew Carr for thirty years. It was first performed at the Vancouver Art Gallery in 1996, and evolved into a catalogue essay, “The Presentation of Self in Emily Carr’s Writings” for the Carr exhibition New Perspectives on a Canadian Icon organized by the National Gallery and the Vancouver Art Gallery in 2006. Shirley Bear and Susan Crean, 2001. Photo: Jane Martin. When the Beaverbrook Art Gallery mounted a retrospective of Shirley’s work in 2009 called Nekt wikuhpon ehpit (Once there lived a woman, The Painting, Poetry and Politics of Shirley Bear, I wrote an essay on her writings for the catalogue titled “N’tow’wik’hegat (She who knows how to make images)”. There I mention her strategy of insinuating Maliseet into mainstream English, and note that my long association with her has made me familiar with two dozen or so words in her language. Many more words that I know in Gaelic, by comparison, the language of my great-grandparents. While living in British Columbia during the nineties I researched and wrote The Laughing One — A Journey to Emily Carr. The book is an exploration of Carr’s legacy in the context of history, which is to say the historical relationship of the incoming Europeans with the first peoples over the matter of land. As this was Carr’s subject — the land, and the carvings of the Aboriginal inhabitants — and the basis of her allure for Eastern collectors and the National Gallery which mounted the 1927 exhibition that brought Carr to national attention, I felt there was a fundamental unsolved problem. Carr and her patrons (which included the Group of Seven) saw Native artifacts as relics of a disappearing people, thinking of them as ‘ancient’ motifs that could form the basis of authentic contemporary Canadian art. History has proven them wrong, of course, but Carr remains a controversial figure. Yes, she was more open to Indigenous culture that most white European Canadians at the time, and she was adventurous in her travels to remote communities. But it is still hypocritical to claim her as a national icon without addressing the appropriation involved; specially when land claims have still not been settled and many Indigenous communities live without basic amenities, a national shame. 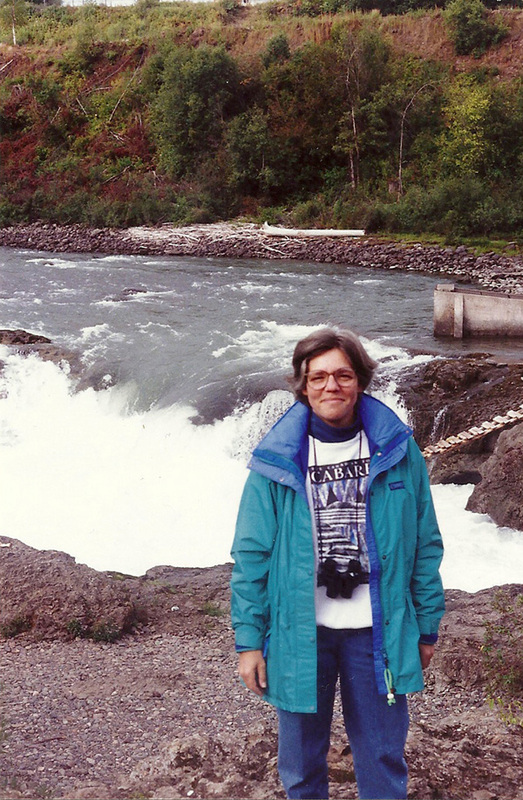 Research for the book included several trips to Indigenous communities on the NorthWest Coast that Carr knew : Villages on Haida Gwai and along the Skeena River. 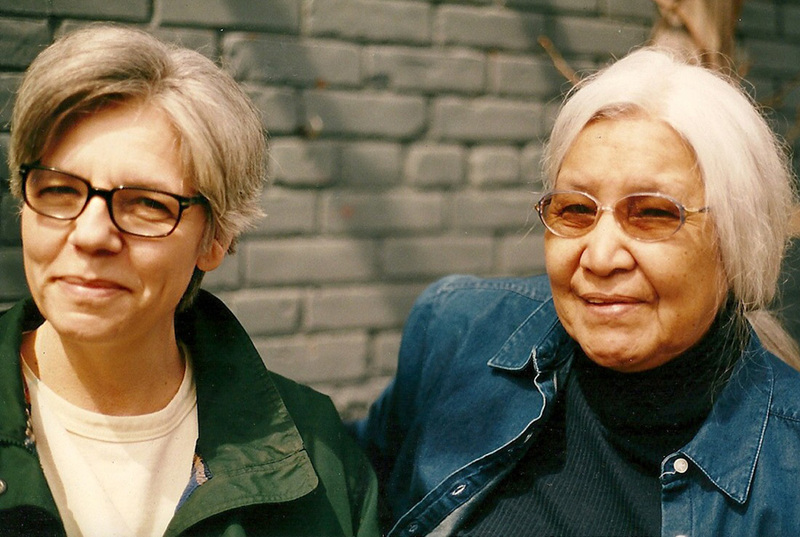 Through Shirley Bear I met the late Haida carver, Freda Diesing, who was part of the Changers exhibition in 1989. When I called Freda to see if I could see her when I visited the area she offered to “show me her poles”. I assumed she was referring to the ones she’d carved at Kitsimkalem and other sites. In fact she meant all the poles east of Prince Rupert along the Skeena and up to Gitanyow and Kispiox that had meant something to her as a late-blooming artist. Freda was one of my guides, and Shirley another. It was Shirley I tagged along with one time when she went to stay with Diane and Dull Browne in Skidegate on Haida Gwai. Shirley was the First Nations’ Advisor and artist-in-residence at Emily Carr College of Art and Design in Vancovuer at the time. I wrote about both trips and both women in the book. 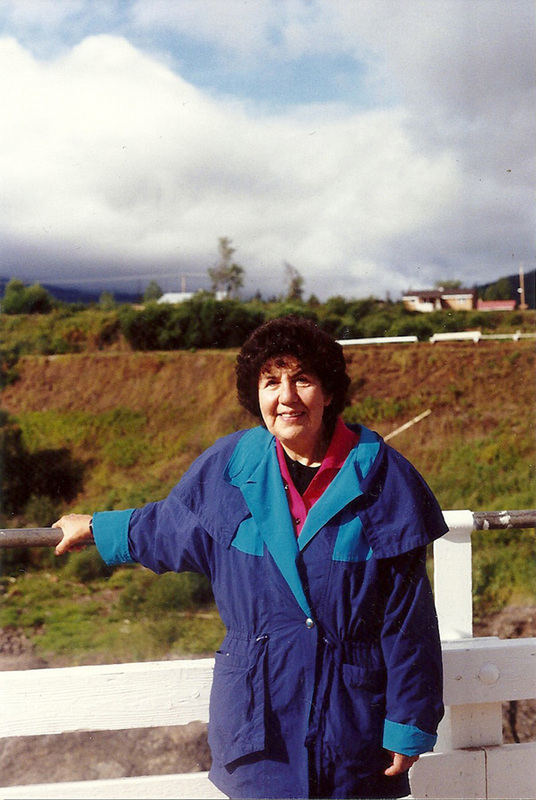 Freda Diesing at the Skeena River, 1991. SMC on the the same trip. Photo: Freda Diesing. Following that book, I decided it was time to publish the unpublished portions of Carr’s journals, and sections expunged from other of her of writings. The result was Opposite Contraries—the Unknown Journals of Emily Carr. Like many activists, I work with communities, serve on boards and committees, and go to demonstrations. Most recently I’ve been on the board of Native Earth Performing Arts. During the fall of 2011, I had the privilege of being the third writer-in-residence at historic Joy Kogawa House in Vancouver. I kept a blog on my time there which you will find on this site.